Jade Gibson is the author of the novel Glowfly Dance. An academic, writer, and visual artist, she has lived in the U.K., Africa, the South Pacific, and the Caribbean. Q: The novel is told from a child’s perspective—your main character Mai is very young at the beginning of the book and 14 at the end. Why did you choose that vantage point? A: This is a true story, which I wanted to immerse the reader in, in order to convey the reality of a child's experience of such situations. There were two main reasons - one was that, as it is based on my experience, a child only thinks in the present tense, and the way in which time is understood is very different from that of an adult. I chose to write in the child's present to convey this - and this means that the child's voice becomes older and older as one moves through the book. The second was to place the reader literally within the child's body, to experience as she experiences. There is no third perspective explanation; you are only seeing as a child, yet as a reader, one perceives much more. I also wanted to show how, despite the most difficult of circumstances, one that some readers describe as horrendous, a child does not lose sense of hope and can stay resilient. This means that other readers have found Glowfly Dance also, in another sense, uplifting, in that shows that a child can survive the most difficult emotional circumstances. I also wanted to show normality in the face of adversity; I was tired of the tropes of the “misery memoir.” Partly for that reason I wanted to include moments of beauty, the very things that Mai, the protagonist (a subtle play on “me”) holds on to that enables her to survive. Domestic violence is not just the misery story. There are moments of humour, love between parent, child and siblings, children, and adults, keep going. Perhaps that is the insidiousness of domestic violence, that we look for the ongoing misery story, whereas in reality it is often punctuated by both the light and the dark. The fact that the story is told in the present tense is also a strong part of the point at which, in a sense, we see Mai growing up, when she first realises that the past may be entirely separate from the present. I think maybe when children realise that they have a “past” narrative, and identify themselves as such, it is a shift towards adulthood, at least, in Mai's case, it is. I also think that there is much written on women within the domestic gender violence situation. Yet the child as witness and documenter is less well dealt with. People often don't consider the ramifications and loss throughout a family, and the impact on children. To this day I feel anger at how little the impact on the children was dealt with, and how the law did not consider the specific case of the siblings left behind in Glowfly Dance. I hear that little may have changed on this front, although this would need to be verified, as I am not a lawyer, but lawyers have told me so. Glowfly Dance plays on notions of “freedom” throughout - from Mai's first dances on her grandfather's feet, to the notion of home as a prison and outside as “free,” to being hidden in a refuge under false names, to the limits of the law to protect women, and the battle that women in these situations go through to get support from people outside, who often do not know how to respond. All of these, I feel, are more so revealed when told through the innocence of a child, who merely records. And that is what I did. The book originally began and ended as an adult rather than a 14 year old with the flashback effect. However, it was already long enough, and the book “jumped” anyway from 14 to adulthood. The majority of readers in my writers group felt that the book could end at 14, and that it would be better to extend the years between into a sequel, explaining what happened after. So that is what I decided. And am now sitting with a draft, needing editing. A: I was obsessed with fireflies as s concept as a child, or what we called “glowflies,” and pretty much anything that flew, which is fairly obvious when you read the book. Again, this as a symbol plays on notions of freedom; but it was also the idea of light in the darkness, the notion of hope. At the beginning of the book, Mai is 14 (the rest of the story is told as if in a flashback, from three years old) and “flying” in a plane, in the air. You learn that everything in life goes in circles, yet when you come back, things change. Mai is imagining the glowflies in Mexico, where her mother and unknown Filipino father met, and how they travel around and around in circles, writing an invisible calligraphy in the air, that if you don't catch and write down, is lost to darkness forever. And that is how the book works - Mai tells her story because she is aware that the story of her mother's life, if not recorded and written down, will vanish, like so many women's lives that are lost to violence, and disappear forever. In that sense, the book is resistance, a determination to counteract, what I see as being completely preventable with the right social information and awareness, the annihilation of a person who did everything she could to survive. The book itself oscillates between moments of darkness and light. That is why I think people say it is both beautiful, and harrowing, uplifting and dark. I wanted to show that life may be full of tragedy, but is also incredibly rich, and that richness of experience and vision carries Mai forwards. It is, as Mai is told when still a toddler, “just how things are.” But we know, it does not have to be that way. Q: You wrote on your blog when your book was first published, “It is strange, to have created something so close to me, and then realise that we are in fact, strangers. Are all writers estranged from themselves?” Is that still how you feel about the novel? A: I think it was a complete shock when I first saw the book on the table. I am pretty sure I took a step back when I saw it. It looked like a brick. I couldn't believe all those years of work and rewriting and angst could just appear as what seemed to be a tiny block of wood. My first thought was, “what have I done?” It had taken a year to agree to publication after being offered, and the publisher actually wrote to me and said, it has been nearly a year since we offered publication, and you did not get back to us, are you sure you really want to publish this? But then, I realised people were thanking me for speaking out, at least those who realised it was a true story, as some to this day think it is fiction, as I changed names and places to protect some people. I also wrote with different names, as if I wrote as “I,” I think it would have been too difficult to write it. Writing as “Mai” was a distancing technique, and it helped provide perspective. Strangely, when I first wrote it, I wrote from a child place, exactly as I remembered. I had been writing it down seriously since 16 years old - in fact some early sections were written when I was still in my teens, and incorporated later. Are we estranged? I can only speak for myself, but one is able to take multiple positionalities, I think, as a writer. You are both inside, and outside. I always say that writers are people who have entire other worlds going on in their heads, and are only sane, because they are aware of it. When you write about the past, or childhood, you are still outside yourself, in a way. The other thing is, as someone who works as an anthropologist/academic as a day job, it was not something I spoke about openly. I would sit in seminars on domestic violence and think, “that was us,” and then wonder how many others present may have had that experience. Academia often does that too. Suddenly, when the book was out, those two sides had to make friends. It was petrifying. Over the past one and half years, I have felt the two sides actually have become more integrated. It has been empowering in some ways. I was worried some people would sensationalise the whole thing, and make it awkward for me. I have had one or two like that, but as is described in Glowfly Dance when Mai is confronted by schoolchildren about the fact she has slanted eyes and “looks different,” I have realised that it is more about them than me. And in my daily life, apart from when I give talks, which can be emotionally challenging, even if rewarding, things are pretty normal. In fact, the book has often been a conduit towards deeper and more meaningful conversations with people I know, and people I don't, forming bonds rather than distancing me. And it has helped people. Interestingly, young men, as well as women. I have had men opening up to me about the domestic violence they witnessed as children. I think writing about the child's experience does that. It surprised me at first, but even in Glowfly Dance, there are boy children who suffer. I even had to speak as an inspirational speaker at a men's Indaba, many of whom I was told were from abusive backgrounds. I think the child perspective creates the universality of Glowfly Dance - I really thought I had written a women's book, but it seems to appeal across the board. The other surprise was hearing women tell me that their 16-year-onwards teenage daughters read it. I thought the time period of Glowfly Dance would appeal less to them, but I guess the child voice may draw them in. So, as people often say, the book has a life of its own. You see your face in it, but you don't. It's like that. Q: In your acknowledgments, you write, “If even one woman looks at her children and is compelled to get out of a situation where her life is at risk, as a result of someone reading Glowfly Dance, then it will have done its work.” Can you say more about the reaction you’ve had to the book? A: Because I didn't know if the book would have any impact on publication, despite the fact that I wanted it to stir people up to make a real effort to change things and thus help deal with social violence, once they understood some of the factors that enable perpetrators (and it is the perpetrators we should be looking at) get away often with the most heinous violence regarding their partners, as has been the subject of major documentaries I have seen aired across the UK, Australia and US in the last two or three years on the very subject of Glowfly Dance, I told myself that even if it touched one person and inspired them to reach out and help someone, or to get out of a dangerous situation in their own relationship, then Glowfly Dance would have done its work. I don't think Glowfly Dance can do the work alone, without a host of discussions and awareness and debate emerging around the book. Glowfly Dance has so far to go still. It has only been published in South Africa to date, where I have been working for some 15 years, and I am British-born, so I kept the literary and film rights outside South Africa, and now have to find a publisher and agent for my book. Some of the work the book has done to date - apart from being shortlisted as a literary novel when unpublished in the Dundee and Virginia Prizes in the UK, and long-listed in the Sunday Times prize in South Africa, as well as being formally recommended by the South African Education Department as useful for education on domestic violence - is to contribute to awareness of issues of gender violence, particularly in breaking silences around people's own experiences. I have had friends who read the book be inspired to talk to friends they know are in domestic violence situations to help them. I have seen women with tears in their eyes that are not about my story, but about their own. I tell people who are overwhelmed and say it is impossible to stop, especially in South Africa, that change comes slowly, but like apartheid, with enough people's effort, it could end. But it takes that effort. The strangest thing was having a friend I knew reach out when her own life was in danger from her partner, having read the book. I am not saying that the book saved her life, but I think it snapped her out of a form of denial into facing a harsh reality. I wrote about it in this article. It was strange because suddenly I was on the other side, having to deal with my own incredulity at having to believe this could possibly happen to a friend of mine. It didn't seem real, yet I knew it would. I hope that the story of Glowfly Dance will help people on the “outside” understand the reality of such situations. It is, as I state in the above article, a sad reality, is that half the women killed by their own partners did not believe it could happen. So we do, as uncomfortable as it may be, need to talk, as there are solutions, and some of them are very easy. A: I have some fictional works that emerged from nowhere, related to the relationship between history and the present. And I have the draft of the sequel to Glowfly Dance, which I need to work through. The problem is that I also have to make a living (which publishing locally so far has not provided) so I have to squeeze that around my academic work, although I am thinking of trying to find a long arts residency or grant. The sequel deals with the aftermath of Glowfly Dance - being a foster child, who effectively has lost all her family, returning to the UK that never accepted her as “British” as a child, now after several years growing up as a teenager abroad. As you can imagine, things did not get easier. I have always said, if fate exists, someone had a wry sense of humour - I was given the gift of writing, and a life that people say sounds like fiction. I really want TIME. A: Glowfly Dance needs to travel further. I want its story to light up the world. As a child, I travelled around the world - across three continents, Europe, Africa and the Americas. This story should travel the path we took, and bring healing. I have so much more to say. In South Africa, on average three women die every day at the hands of an intimate partner. How many children are left behind? I also want to undo the idea of women in these situations being helpless, problematic or creating their own victimhood. There is enough research now to show that anyone in a domestic violence relationship is in a very difficult situation when it comes to leaving. What we often fail to ask, is why is the perpetrator doing it in the first place, and why should they get away with it? Having said that, I also want the reader to encounter the many women and places in the book, that shows a multitude of ways in which women experience life. Mai's slanted eyes were a witness to all of this. And today, they are writing these worlds, and there is so much more to do. I also want people to think seriously about the many children who are witnesses and/or directly experience domestic violence and then grow up to be adults. I tried to look up what research had been done into child survivors of families where mothers had been killed by their intimate partners. Despite the figures as to how many women die a year, there were documents stating that practically no work had been done on the impact on children. You see the reaction to Mai and her siblings' experience in Glowfly Dance. My artwork also deals with aspects of gender and social violence, as well as some of my poetry and academic work. Apparently, I can also be very funny. Perhaps that is what survival is all about - when people ask me, how did I get through it all, I often say, although you need to acknowledge and accept the dark sides, the best revenge for a difficult past is to be able to laugh and smile as an adult. 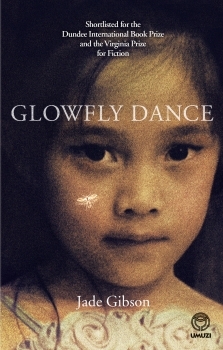 Also, it would be great to link with organisations who could work with me in spreading awareness of Glowfly Dance and its story, or if people know of possible agents and/or publishers who might be interested outside South Africa, to put them in contact. I want everyone to be talking about the content of Glowfly Dance, if possible. It is my life's work, since I was that 14 year old flying in the 'plane at the beginning of the book.